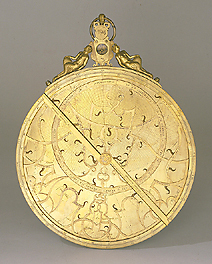 This remarkable astrolabe is made up of the mater and ten plates, calibrated for different latitudes. A compass, complete with its magnetic needle, is located in the suspension. On each side of the compass is a satyr one feminine and one masculine, characteristic of astrolabes from this workshop. The back of the astrolabe bears the markings for the hour lines and the half shadow square, to carry out topographical operations. Gualterus Arsenius, the Flemish 'nephew' of the famous Gemma Frisius (1508-1555) was a maker of extremely refined measuring instruments, including astrolabes and armillary spheres. He was active in Louvain, between 1558 and 1579.